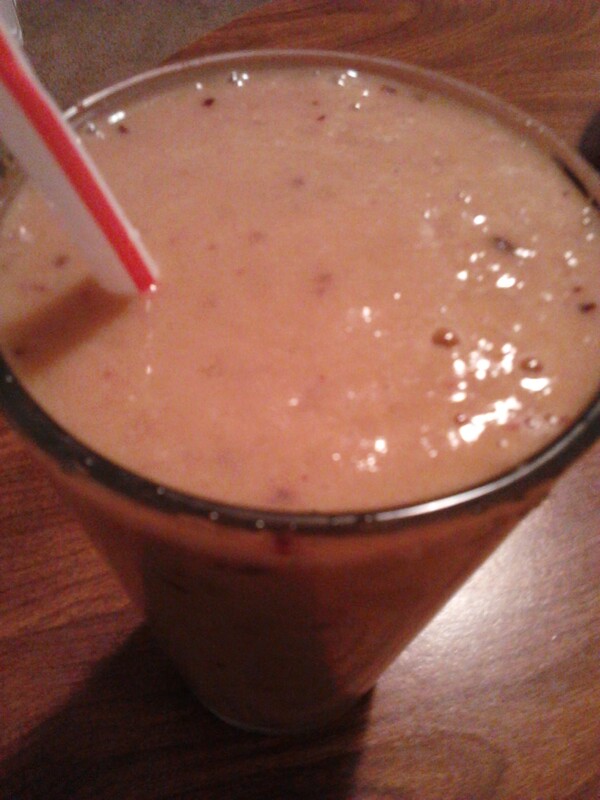 Yesterday’s smoothie was simple and delicious. I wanted something that is yummy and easy to prepare. I didn’t have any strawberries so I decided to use the last mango in the fruit bowl since I knew the kids were going to fight over who gets the last mango. I cut up the mango and then a medium banana plus a red plum. My oldest asked for plums and as usual she doesn’t eat them all. I like plums but only when they are paired with something else. So I figured taking one of her plums wouldn’t be a bad idea. I placed the fruit in the freezer before starting on dinner. The kids voted on tacos and I modified the menu and changed the meat because I really hate red meat. I suggested we substitute the ground meat with Tilapia and they agreed. I made dinner and then went for a short run while they worked on their homework. My run was shorter than I planned, my right leg forced me to turn around after only 1 mile. I might have to see my doctor about the pain because my ankle brace is no longer helpful and I can’t train if the pain is only going to get worse. Fast forward to about 30 minutes later to our family dinner and it was a hit. Fish tacos without sour cream and with carrots, Romaine lettuce, baby cucumbers, mild salsa, Tilapia and sweet corn inside soft whole wheat shells and the kids asked for seconds and thirds. I didn’t expect them to like it at all. My kids are picky eaters and so this was great. I had my smoothie instead of the tacos because my stomach was upset and I didn’t want to eat anything heavy. I am still feeling sick so I will definitely be calling my doctor in the morning. I have been nursing cold and flu like symptoms for several months and nothing seems to be working. I keep thinking that it might be stress but I removed the major stress factor I had and still I can’t catch a break so it’s time to do more. Well, I better get back to my school work. My munchkins are fast asleep and I have a midterm this week. Thank you for stopping by and below you will find the complete recipe for my smoothie and a picture of it. Posted in Health/Fitness, Parenting, Recipes and tagged banana, cold like, fatigue, flu like, healthy options, Mango, red plum, smoothie, tacos, Tilapia. Bookmark the permalink.